DIRECTIONS: Travel south on Gulf Freeway to exit 22 (TX 96). Go east past Highway 3. Turn right (south) into Hometown Heroes Park across from Tuscan Village Dr. If you reach FM 270, you have gone too far. SPECIAL INSTRUCTIONS: Deck space is limited- Coaches can set up on deck. Swimmers can bring chairs to sit with team. Most of the teams will have to set up tents/team areas on the West side of the pool outside the fenced area. Pool entrance is behind the building on West side. Limited entry may be available on the East side. With limited deck space, spectators will need to come in, watch their swimmer, and then exit pool area so that everyone can see their athletes during their swims. There will special viewing areas for disabilities. *Split warm-ups will be in effect, with assignments posted on the Gulf Swimming website. 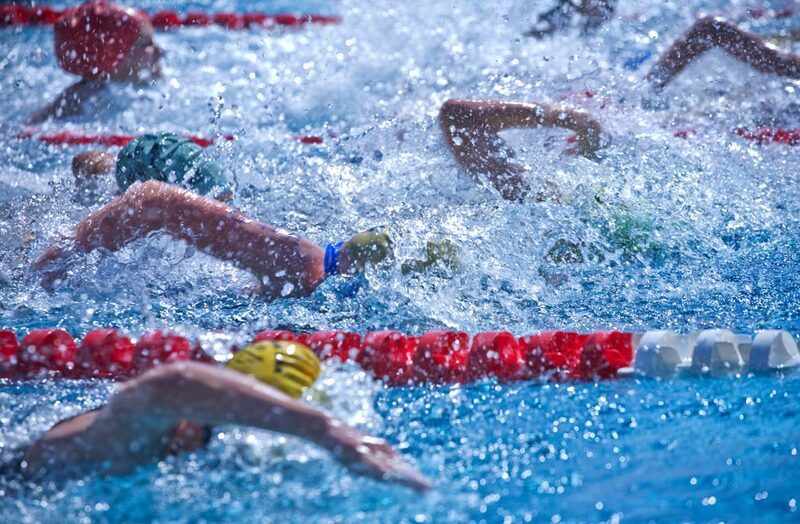 Lane assignments for warm-ups and timing will be designated in the heat sheet, and posted on the Gulf Swimming website by Monday, April 22, 2019. Session 1 – FRIDAY. This meet will be run utilizing chase starts. Odd heats will start at the building end of the pool, even heats will start at the opposite end. All 50s will start at the end, opposite to the building. At the conclusion of each heat, the swimmers shall exit the pool asap. Coaches, please remind your swimmers of the “Chase Start” procedures. All 400 meter events will alternate girls and boys heats and swum fastest to slowest. All 1500m events will be swum girls and boys combined, fastest to slowest heat. The meet will be deck seeded. Coaches, please inform your swimmers of seeding on deck rules. Once the check-in period closes at 45 min. BEFORE the session begins, all events will be seeded. All events will be seeded with heats in the order of fastest to slowest. Entry Times: Swimmers must enter at their best time. Entry times must be submitted in the course at which the best time was achieved – long course meters (L), short course meters (S), or short course yards (Y). Do not convert meter (yard) times to yard (meter) times. If entries are made by paper (not using Hy-Tek), swimmers should indicate on their entry the course at which the entry time was made (i.e., L, S, or Y). If swimmers have never competed in a USA Swimming meet before, put NT where a seed time is requested. Times must be from USA Swimming meets. Times Eligibility: Times must be achieved between July 1, 2017 and the entry deadline. Swimmers may compete in up to four (4) individual events per session with a total meet limit of nine (9) events. Tier 1: AQUA, HCAP, LAP, SHAC, SHRK, SSS, SWAT, and TTST. Tier 1 teams are guaranteed to be accepted. Tier 2: AGS, COOG, LJAC. Tier 2 teams will be accepted on a first come first served basis, capacity available. Other Gulf teams may enter after Tier 1 and 2 to meet capacity on a first come first served basis. (4 hour rule).